"Activists at a Chicken Save pleaded with slaughterhouse staff to get a sick chicken off the livestock truck. Security wanted to cooperate but the manager had other plans. He tricked activists into thinking the request would be met but in actual fact the police were alerted. So, the activists sought other opportunities and found a cracked crate. 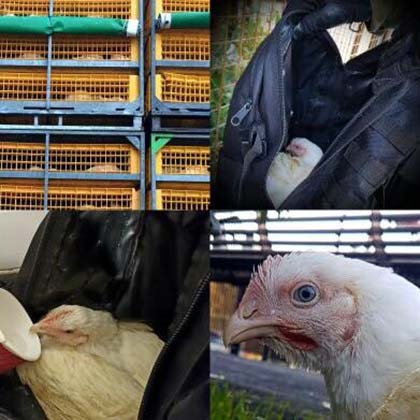 Cover was provided while an activist pulled on the crate to widen the crack, allowing another to reach in and take a chicken. The activists ran off just as the truck driver spotted them. Moments from slaughter, this chicken is now free to live a life of liberty and contentment. We appreciate people are grateful, but for us - to not attempt to save an animal that's about to die is a crime in itself. Freeing animals is mandatory!"